On May 28, 2018 Armenia and the Armenian nation celebrate the 100th anniversary of the establishment of the Republic of Armenia. The Ottoman Empire, the leaders of which planned and carried out the 1915 Armenian Genocide, was the first state to have recognized Armenia. 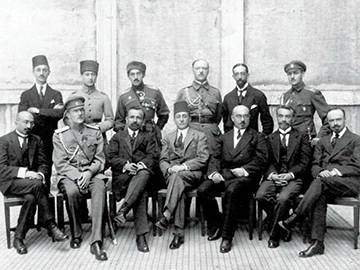 The Treaty of Peace and Friendship was signed in Batumi between the Ottoman Empire and Armenia on 04 June 1918. Hence, on the June 4th, it will be 100 years since the first international diplomatic document has been signed by Armenia... with Turkey. Under the Batumi Treaty, the border between Turkey and Armenia was drawn. The Treaty that had to be ratified within one month in Constantinople, hadn’t been ratified either. And the border drawn under the Batumi Treaty was changed in favor of Armenia a few months later, for the Ottoman Empire was defeated in World War I and removed the troops from the occupied territories of Eastern Armenia. The successor states of the Ottoman Empire and the Republic of Armenia, that is present-day Turkey and Armenia, are approaching the 100th anniversary with “zero” relations, close borders and preconditions. In 1991, when Armenia through referendum declared its independence, Turkey was among the first countries to recognize Armenia. Ankara, however, refused to establish diplomatic relations with Yerevan, as well as to launch the two Turkish-Armenian border gates, such as Alijan – Margaran and Dogukap - Akhurik. Turkey put forward two preconditions: Armenia must recognize the Turkish-Armenian border, which was established under the Treaty of Kars in 1921, that is, waive territorial claims, as well as put an end to the process of international recognition of the Armenian Genocide. In the spring of 1993, when Artsakh (Karabakh) forces marched into Karvachar / Kelbajar, Turkey locked the two border gates through which wheat had been transferred to Armenia and put forward the third precondition: “As long as the status quo is not changed in the conflict zone of Nagorno-Karabakh, which would have satisfied the minimum expectations and wishes of Azerbaijan, Turkey will not end the blockade and will not open the border gates”. Thus, a new complication, called Azerbaijan, was added to the Armenian-Turkish complicated relations, the destructive role of which once again had to be unmasked on the days of "football diplomacy" in 2008-2009. Considered a strategic ally and partner of Armenia, Russia is also among the countries indirectly involved in Armenia-Turkey relations. The Russian 102nd Military Base is located in Gyumri near the Armenian-Turkish border, the main mission of which is to protect Armenia from external threats. Furthermore, Russian border-guards are standing along the Armenian-Turkish border together with the Armenian border-guards. What stance does Moscow take on the issue of normalization of Armenia-Turkey relations? Russia has not publicly taken any actions, has not made any statements against the improvement of Armenian-Turkish relations since 1991. Moreover, in October 2009, when the two Armenian-Turkish protocols were signed in Zurich after a three-hour delay, the Russian Foreign Minister Sergei Lavrov, having joined the ceremony, did not hinder the process anyhow. There are many questions meanwhile. In case Turkey opens the border and establishes diplomatic relations with Armenia, doesn’t the Russian military presence in Armenia become needless? In case Turkey-Armenia normal relations are established, doesn’t the presence of the Russian border-guard on the Armenian-Turkish border become needless? After Armenia joined the EAEU and refused signing the Association Agreement, isn’t it Russia that has been dictating Armenia’s foreign policy on the most important issues, including Armenia-Turkey issue? Even if Moscow is not against the normalization of Turkey-Armenia relations, shouldn’t that normalization be the way not to contradict the vital interests of Russia. After all, the Russian military presence – the 102nd Military Base and Russian border-guards - in Armenia is not only for saving the Armenian people from a new Turkish attack, as it is presented, but because the 102nd Military Base and Russian border-guards protect Russian interests in Armenia. On the other hand, as mentioned above, Russia has not taken any actions since 1991, has not made any statements that would enable us to confirm that Moscow is impeding normalization of Armenian-Turkish relations. We can make such a statement in case of Azerbaijan. By and large, however, involvement of the third countries in the Armenian-Turkish issues only complicates and makes more obscure the prospect of normal relations between Yerevan and Ankara, for every third party has its own interests. Since 1991, Armenia and Turkey have made three attempts in establishing diplomatic relations. All those three attempts failed, because Ankara had put forward preconditions. This means that Armenia does not have an important place in Turkey's foreign policy agenda. If Armenia were important for Turkey, the Turks would have definitely found the ways of dropping preconditions, even in case of the most severe counteraction of Azerbaijan. The first attempt was made when in 1992-1993 the Armenian and Turkish diplomats were working on a protocol by which relationships had to be established. However, the protocol was left half-way after Artsakh (Karabakh) forces marched into Karvachar in April 1993, in response to which Turkey locked the half-opened border with Armenia. Around 58 thousand tons of wheat out of planned 100 thousand reached Armenia through two border gates within the previous six months. The second attempt took place in 2005-2007, when Armenian-Turkish confidential negotiations were held at the level of deputy ministers of foreign affairs. During this period meetings were also held between ministers of foreign affairs Abdullah Gül and Vartan Oskanian, which inspired hope that there would be a turning point. No change occurred, because Turkey once again brought the preconditions into the negotiation agenda. The third attempt took place in 2008-2009, when presidents Abdullah Gül and Serzh Sargsyan visited Yerevan and Bursa respectively to watch Armenia-Turkey football matches together, when the two protocols, which were controversial and severely criticized but at the same time welcomed by international community and ruling authorities of Armenia, were signed in Zurich in October 2009. Turkey, the country’s parliament refused to ratify the protocols, once again referring to Artsakh (Karabakh) conflict. Will Turkey establish diplomatic relations with Armenia and end the blockade, if there takes place a change in the status quo in the regulation of Artsakh (Karabakh) issue, which will be more or less acceptable for Azerbaijan? In other words, won’t Turkey insist on the fulfillment of two other preconditions any longer, that is, re-approval of the Treaty of Kars and termination of the campaign aimed at the international recognition of the Armenian Genocide? We can’t answer this question. It is a fact that, even though indirectly, but with Zurich protocols Turkey’s proposed preconditions were met. Today, the Armenian-Turkish relations have been at a possibly low point since 1991. If prior to the football diplomacy, regular meetings have been held within the framework of various international forums between the foreign ministers, prime ministers and presidents of Armenia and Turkey, if there has been a communication between respective departments of the Ministries of Foreign Affairs of both countries, today and within the recent years there are no such meetings and communications any longer. The only link between the presidents Sargsyan and Erdoğan can be considered those telegrams of condolences that the leader of Armenia has sent to his Turkish counterpart on several terrorist actions that had shocked Turkey in recent years. It is worth mentioning that for four years running, that is, in 2010, 2011, 2012 and 2013, Serzh Sargsayn had sent a congratulatory message on the day of establishment of the Turkish Republic on 29 October to his Turkish counterpart Abdullah Gül. Gül, in return, also congratulated on the Independence Day of Armenia on September 21, by sending a telegram to Sargsyan. When, in 2014, Erdoğan became a president, the leaders of Armenia and Turkey stopped the emerging tradition of congratulating each other on national holidays. The Ottoman Empire not only was the first country to have recognized the Republic of Armenia and to have signed the Treaty of Peace and Friendship with the latter, but declaration of Armenia’s independence was forced by Turks and the result of the created political situation. Transcaucasian Sejm (Diet) called its last session in Tbilisi on 26 May 1918, during which the proposal of the Georgian Mensheviks on dissolution of the Democratic Federative Republic of Transcaucasia was approved. On the same day in the evening, the National Council of Georgia declared independence of Georgia. On May 27, the National Muslim Council in Tbilisi decided to proclaim the independence of Azerbaijan. The Armenian National Council in Tbilisi condemned the step of declaring independence of the Georgian people on May 26. At the sitting, dated May 26, Armenian Social Democrats expressed strongly in favor of the independence of Armenia and Avedis Aharonian, Ruben Ter-Minasyan and Artashes Babalyan from ARF, as well as SRs, that is Socialists Revolutionaries, non-partisans, strongly opposed to it. Some of ARFs, led by Simon Vratsyan and Khachatur Karchikyan, were for the independence, because they did not see any other way out. ARF representatives Hovhannes Kajaznuni and Alexander Khatisian, who were in the Transcaucasian delegation negotiating with the Turks in Batumi, were among the strongest defenders of independence. The next day, in the evening of May 27, Kajaznuni, Khatisian and Michael Papajanyan (People’s Party of Armenia)1, having returned from Batumi, made a detailed report on the negotiation process and the situation formed after the actions taken by Georgia. A day later, on May 28, the Armenian National Council in Tbilisi sent Kajaznuni, Khatisyan and Papajanyan to Batumi once more, but this time as the Armenian delegation, delegating an absolute authority to the latter to negotiate and conclude peace with the Ottoman Empire. A joint meeting of the Armenian Revolutionary Federation (ARF) Eastern Region and Western Region Bureaus, RAF Central committee, RAF parties of Sejm and National Council was convened on May 29, and on May 30 the Armenian National Council in Tbilisi passed a statement not including the words “independence and republic”. Revolutionary Committee of Baku, which was cooperating with Bolshevik Stepan Shahumyan, spoke against the decision of the Armenian National Council in Tbilisi and qualified it as a violation of the will of the Armenian nation. The Social Democrat Hunchakian Party (SDHP) and the Armenian Bolsheviks also came out against the statement dated May 30. The stance of the latter was clear – the Armenian nation cannot live without Russia and the Russian Bolsheviks. Transcaucasian central department of Hunchakian Party complained of the announcement, having qualified it as illegal. Socialist revolutionaries who were against the declaration of independence, those remaining neutral and a part of RAF were concerned that the Turks conquered the most part of Armenia and that getting separated from Russia was causing a serious concern. Besides, the requirement to declare independence and getting separated from Russia was put forward by the Turks themselves. As evidenced by Simon Vratsyan, the Armenian National Council in Tbilisi had to declare Armenia independent "because at that point everybody considered the independence as a terrible prospect and a threat to bring the Armenian nation under the yoke of the Turks." "On May 1918, the Turks could have conquered both Yerevan and the whole Armenia, but they didn’t. On the contrary, on June 4 in Batumi, they signed a Treaty of Peace with the representatives of the newly-established government of Armenia and, thus, actually recognized Armenia's independence," writes Vratsyan. Thus, 28 May 1918 is considered the date of proclamation of Armenia’s independence or the date of establishment of Armenia's First Republic not because it was the day the declaration-statement was passed, not because, in Sardarapat and Bash-Aparan, the Armenians stopped the intrusion of the Turks to Yerevan, but because the Armenian National Council in Tbilisi just on 28 May decided to send a new delegation to Batumi and negotiate with the Ottoman Empire on behalf of Armenia. In September 1918, at the meeting with Sultan, interpreted by Enver Pasha, the head of the Armenian delegation in Constantinople Avedis Aharonian, said. "The Armenian nation for its part and the Republic of Armenia will never forget that they owe much of their independence to the wishful disposition of the Ottoman Empire." Although under the Batumi Treaty Armenia received the territory of 12 thousand square kilometers, the country's leaders faithfully followed the terms of the treaty. A short time later, the Ottoman Empire had its embassy in Yerevan in one of the buildings of today's Sakharov Square and Consulate in Gyumri. Despite the sovietization of Armenia in 1920, the Turks continued to have their embassy in Yerevan until October 1923 and Consulate in Gyumri until 1925. In its turn, Armenia had diplomatic representation in Constantinople. Up until the fall of 1918, when the Ottoman Empire was defeated in World War I, Yerevan and Constantinople were maintaining normal relations with each other. One can even say that the newly independent Armenia, Georgia and Azerbaijan were the youngest allies of the quadruple alliance of the Ottoman Empire, Germany, Austria-Hungary and Bulgaria. Armenia would often turn to the Turks for help. Thus, in the August of 1918, when one of the slaughterers of the Armenian people Khalil Pasha arrived in Yerevan from Tbilisi, he was hosted by the Prime Minister Hovhannes Katchaznouni in the house of the interior minister Aram Manoukian. Aram, who had known Khalil from Van, managed to have the wheat brought from the empire for starving people of Armenia with his support. Catholicos of All Armenians received Khalil in Mother See of Holy Ejmiatsin. In September of the same year, the Armenian delegation in Constantinople tried to come in between through Enver and Talaat, so that under the persuasions and pressures of the latter Azerbaijan would sent oil and wheat for Armenia. Armenian-Turkish relations continued also with the Kemalists having come to power. However, already in the fall of 1920, the Turkish-Armenian war erupted, which was fatal for Armenia. Turkish troops, led by Kâzım Karabekir Pasha, seized Kars region, having joined Armenia in the spring of 1919, followed by Alexandropol, today's Gyumri within weeks. On December 2-3, 1920, when Armenia had already been sovietized, the Treaty of Alexandropol was signed by Alexander Khatisian and Kiazim Karabekir respectively. The Treaty of Kars, outlining today’s borders of Armenia and Turkey, was signed in October 1921 and ratified one year later. This presentation was part of the colloquium "Which Future for the Armenian-Turkish Dialogue? Balancing memorial issues and international relations" that took place in Yerevan on 17 February 2017. The colloquium was organized by Yerkir Europe in partnership with the French Embassy in Armenia, the French University in Armenia (UFAR), the Fonds d'Alembert project of the Institut Français, the Regional Council Auvergne-Rhône-Alpes and the City of Lyon.